Thank you again to D'Nique for commissioning this episode! 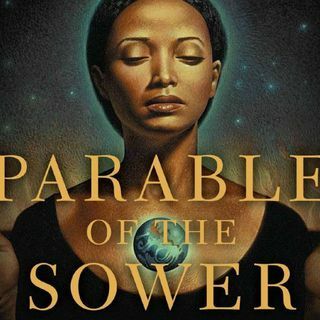 So I had been saying last time I recorded on Parable Of The Sower that I wasn't sure what the book was actually going to be about. In other words, there was a lot of worldbuilding and daily events being shared, but there wasn't necessarily an overarching plot or goal, so I was thinking that perhaps the whole book was going to be a "slice of life" style story that just relayed the events happening to this one ... See More specific person in a mess of a world. I'm beginning to think, however, that I know where this is heading... and I'm dreading it. In these chapters, Lauren's brother leaves and joins a gang and then gets tortured to death, and then her father disappears. These horrific events are interspersed with numerous attempts, some successful some less so, to break into the community and steal food and electronics and whatever else isn't nailed down. I have a suspicion that this relatively comfortable oasis in the midst of the seething mass of poverty surrounding it...isn't going to last much longer. And I am not excited about seeing this happen.